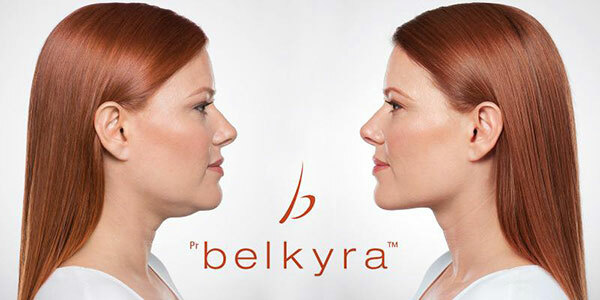 BELKYRA™ is a Health Canada approved non-surgical treatment designed to improve the appearance and profile of the fat below your chin (a.k.a. the double chin). A double chin (submental fat) is a common condition when fat forms below your chin. While mostly associated with weight gain, a double chin can also occur due to genetics or looser skin as you age. With the introduction ofBELKYRA™, there is finally a non-surgical treatment for reducing the bulging fat under your chin that provides long-lasting results. 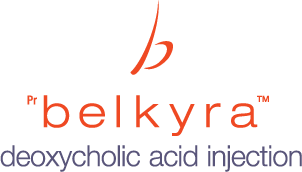 BELKYRA™ is an injectable treatment that uses the active ingredient deoxycholic acid, a naturally-occurring molecule in the body that aids in the breakdown and absorption of dietary fat. Once injected into the submental area, the deoxycholic acid breaks down the fat cells by disrupting the membranes, allowing the fatty acids and glycerol in these cells to be released. The fat that is removed never returns, offering permanent results. Q: Do BELKYRA™ injections hurt? A: Like any injection treatment, you will feel a slight prick during the process. If required, a topical numbing agent can be applied to help make your BELKYRA™ treatment as comfortable as possible. Q: Is there any downtime with BELKYRA™? A: You can expect 2-3 days of swelling. However, you can return to your daily activities immediately following your BELKYRA™ treatment. Strenuous exercise should be avoided for one week following treatment to avoid prolonged swelling. Q: Can BELKYRA™ be used on other parts of my body? A: No. Currently, BELKYRA™ is only approved for use on the submental area of the body and nowhere else. Q: How many BELKYRA™ treatments will I need? A: The number of treatments depends on the severity of your double chin. If you have a prominent double chin, you may need up to four BELKYRA™ treatments, with sessions spaced out six weeks apart (to allow time for fat to break down and dissolve). Q: Are results from BELKYRA™ permanent? A: Yes. Since BELKYRA™ destroys the fat, it will not re-accumulate. However, excessive weight gain after treatment may reverse the results. Therefore, we recommend all clients follow a healthy diet and exercise plan after seeing results from their BELKYRA™ treatment.